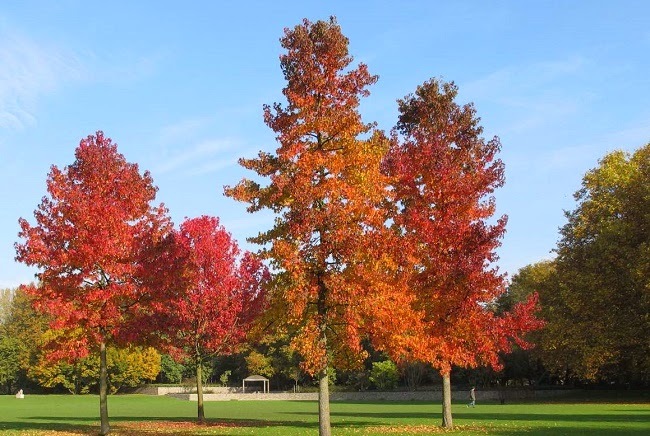 Liquidambar styraciflua is a small tree growing to approximately 18-25 ft tall with a spread 8-12 ft. It has a slender, pyramidal habit with shiny dark-green, lobed, palmate alternate leaves. Inconspicuous green-yellow flowers are produced in March, and the bark displays deeply fissured corky outgrowth on mature specimens. During the autumn, and depending on soil conditions, the leaves turn a brilliant orange and scarlet. This will usually be around October and November in northern European climates. Liquidambar styraciflua will perform best in a slightly acidic, moist, but well-drained loamy soil. However it can tolerate waterlogged conditions from short periods of time. It will prefer a sheltered position in full sun, but will also tolerate partial shade if need be. Unfortunately it will not do well in the shade of a higher tree canopy. Aim to plant specimen trees between November and March but avoid disturbing the root ball. It is advisable to purchase pot grown trees rather than bare-root stock. This particular species is usually grown as a standard with a straight stem. Once the desired height has been reached, cut of the tip of the leading shoot to encourage branch development and formation of a canopy. The following year, reduce all new growths by one third and remove any side growths from the main stem. Remove the side growths as soon as they appear by rubbing them off with your thumb. Leaving them until they are shoots which require pruning will encourage further side growths to appear at the base of the cut.